Greater Philadelphia Bicycle News: Are Party Bikes Back On The Scene? Are Party Bikes Back On The Scene? Amending Chapter 9-400 of The Philadelphia Code, entitled “Carriers,” by adding a new Section 9-408, entitled “Multi-Seat Pedalcycles,” to provide for the licensing and regulation of businesses operating Multi-Seat Pedalcycles for hire, all under certain terms and conditions. equipped with four or more seats and sets of pedals, on which one person (the “driver”) controls the steering and braking system. That doesn't say "Party Bike" or its more common name "Conference Bike" but it is one of two contraptions that we know of in existence that match that description. Or could they be talking about Surreys, you've seen these on the boardwalk. 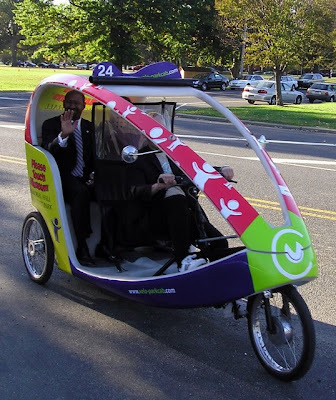 Councilwoman Jannie L. Blackwell proposed a bill that would allow "multi-seat pedalcycles" that would operate between the Philadelphia Zoo and areas of Fairmount Park including the Please Touch Museum. 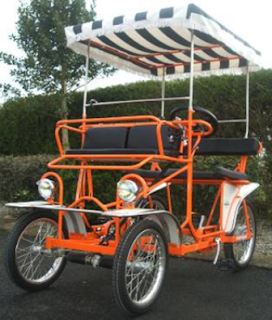 The pedalcycles feature a bicycle that pulls a two-wheeled carriage. There will be a hearing on this plan on Thursday and the pedalcycles could be in use this summer. Followup - This bill is being held by council for a rewrite.